Guests tonight on Hughesy, We Have a Problem are Kate Langbroek, Anne Edmonds, Merrick Watts & Sam Simmons plus an appearance by Brooke Satchwell. 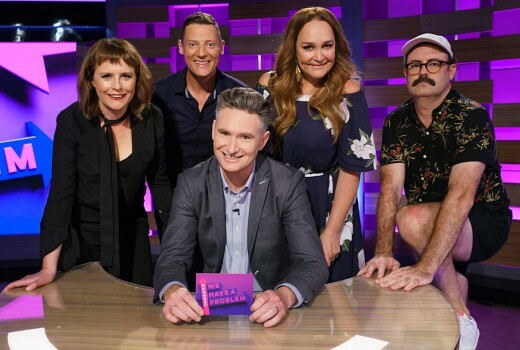 Radio partners Kate Langbroek and Dave “Hughesy” Hughes ruffle each other’s feathers when she joins the panel of Hughesy, We Have A Problem tonight at 9.00pm, only on TEN and WIN Network. The long-time friends cannot resist taking a friendly jab at one another as they work through everyday issues alongside some of Australia’s funniest problem-solvers: Anne Edmonds, Merrick Watts and Sam Simmons. Some of the big questions up for analysis this episode include is it ok to play offensive music in front of a baby, how do I tell my house guest to clean up her act, and how do I bring the love back to my marriage? Also this episode, beloved Australian actress Brooke Satchwell comes in to seek help with her hoarding habit that is slowly taking over her life. I agree. This is a thin concept for a show and I expect it will be one of the early fails for the year.